Discover Canada: The Rights and Responsibilities of Citizenship - Gateway to Canada | Canada Immigration Consultancy! Citizenship, Immigration and Multiculturalism Minister Jason Kenney recently launched a new and more comprehensive study guide for Canadian Citizenship - Discover Canada: The Rights and Responsibilities of Citizenship. This study guide was first created in 1995. Discover Canada: The Rights and Responsibilities of Citizenship includes information on common values such as freedom, democracy, human rights, the rule of law and the equality of men and women. It promotes to immigrants and Canadian citizens alike a greater understanding of Canada’s history, values, symbols and important Canadian institutions, such as Parliament and the Crown. It also highlights the contribution of ethnic and cultural communities in shaping our Canadian identity and the sacrifices made by Canada’s veterans for our country. 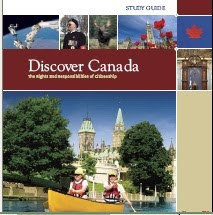 Discover Canada: The Rights and Responsibilities of Citizenship can be downloaded here. if you are planning to live and work in Canada, I strongly suggest that you get a copy and start familiarizing yourselves about Canada.